Pete Dellarco began racing at age 9. He raced quarter midgets with the Rocky Mountain Quarter Midget Association from 2004 to 2007. Pete was the 2006 Region 8 Monza Champion in Heavy Honda. He won the club champion in Heavy Honda in 2007. Also in 2007, Pete set the all time track record in Heavy Honda at Peublo Motorspports Park. After a year off, Pete began driving Legends in June 2009. In 2010, his first full year in Legends, Pete raced 17 times finishing with 4 top 5 and 9 top 10 finishes . In July, he won a trophy dash at Colorado National Speedway (CNS) and he won the Young Lion National Qualifier at CNS in September. Overall, he placed 6th in RMLRA club points and 8th in points at CNS. 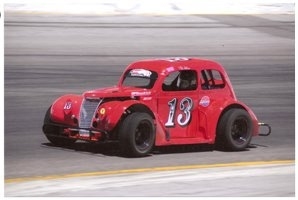 Pete was the 2010 Colorado National Speedway Rookie of theYear in Legends. He also was the 2010 US Legends Cars International Colorado State Champion in the Young Lions Division.